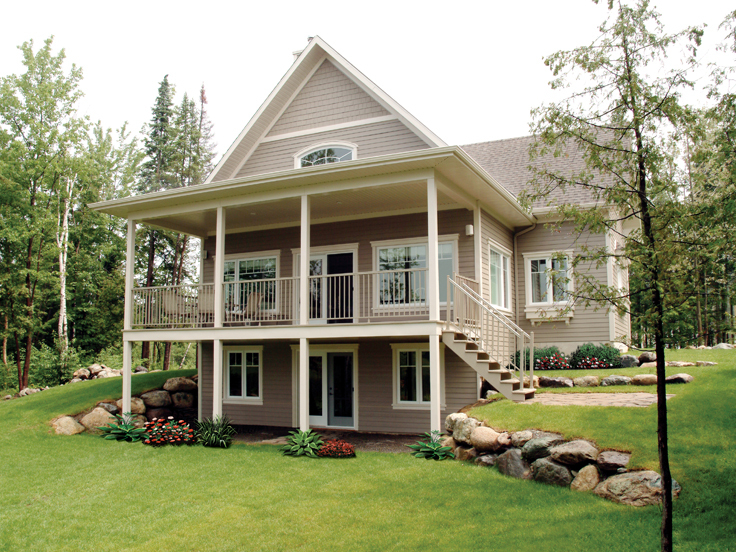 This versatile vacation home plan can satisfy the needs or a broad range of buyers. It features a narrow footprint while offering comfortable and relaxed living. Furthermore, it is built on a walkout basement foundation making it well-suited for sloping or mountainous lots or those overlooking lakes and other bodies of water. 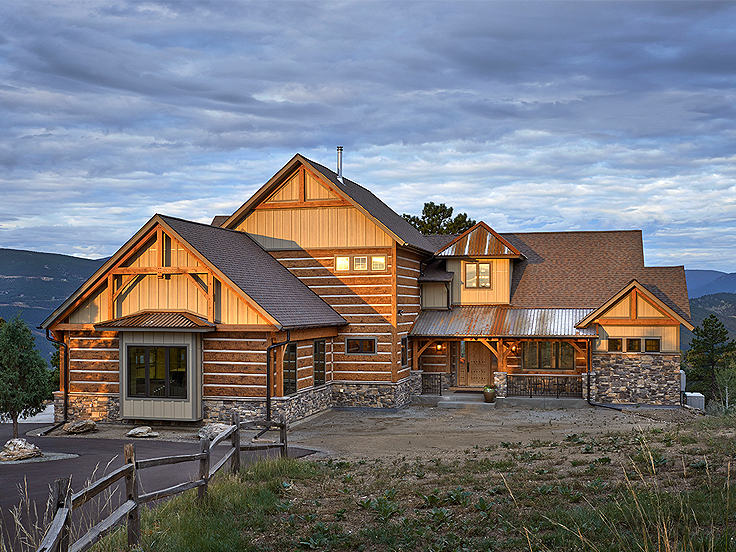 Careful planning and thoughtful design deliver a floor plan that takes advantage of panoramic scenery and stunning views by incorporating plenty of windows and a covered porch to take in the surrounding views. The main level offers an efficient kitchen anchored by a cooking island with extra seating for family and friends. 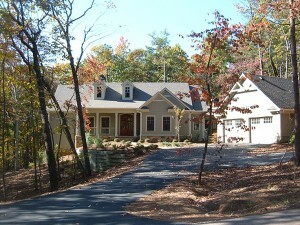 It is adjacent to the combined dining and living areas which enjoy access to the covered porch/deck. Here you can enjoy the sights and sounds of nature without leaving the comfort of your home. A two-story ceiling combines with sparkling windows to create an open and spacious feel in the living areas. Your first floor master bedroom features a walk-in closet and semi-private bath access. Upstairs you’ll find a sitting area as well as a second bedroom and bath, just right for weekend guests. Enjoy a relaxing get-away with this two-story, vacation home! 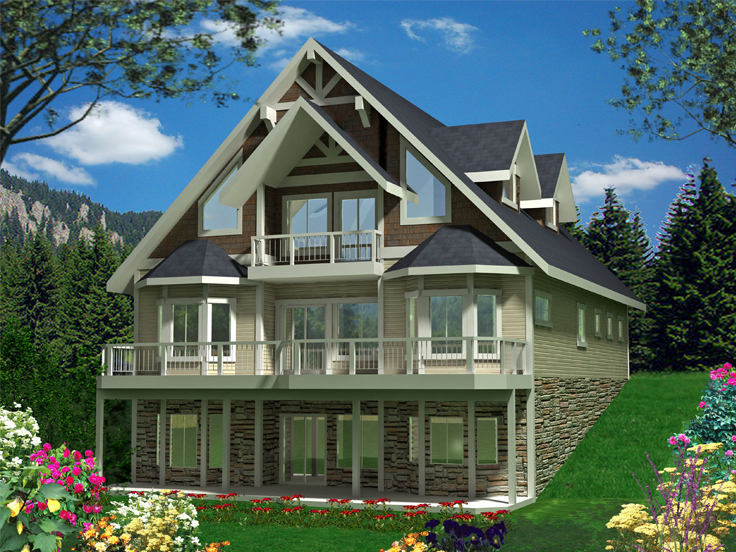 Please visit our webpage to learn more about this vacation house plan. 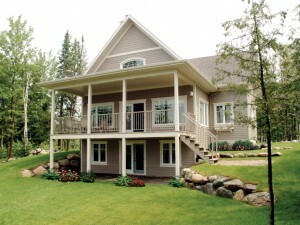 If you’d like to see more plans like this one, please browse our vacation home plan collection. 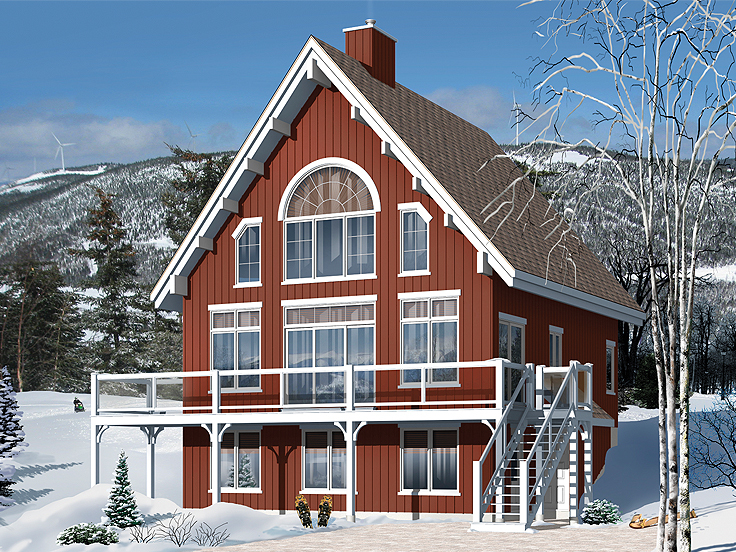 The House Plan Shop has added a new home plan collection to their website – Mountain House Plans. 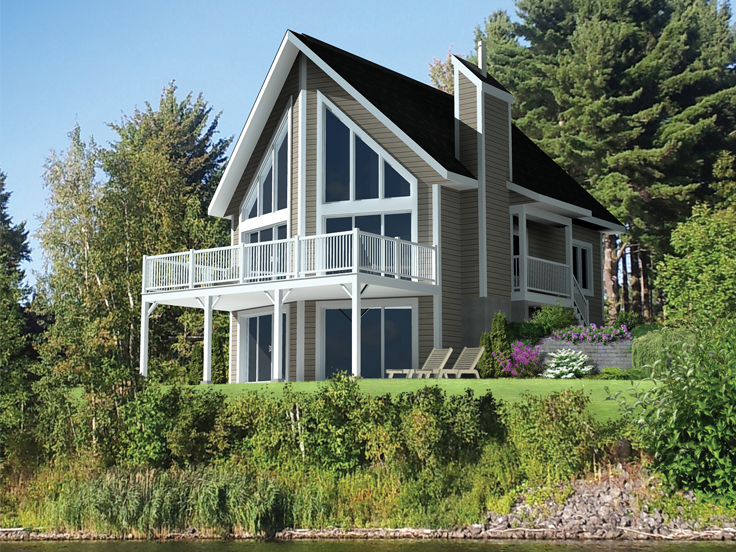 This new home plan collection showcases the work of many leading residential designers and architects throughout North America delivering a great selection of floor plans to choose from. All of the designs in this collection are well-suited for rugged or mountainous terrain or sloping and hillside lots. Furthermore, many include a fabulous array of windows promoting the enjoyment of scenic and panoramic vistas. 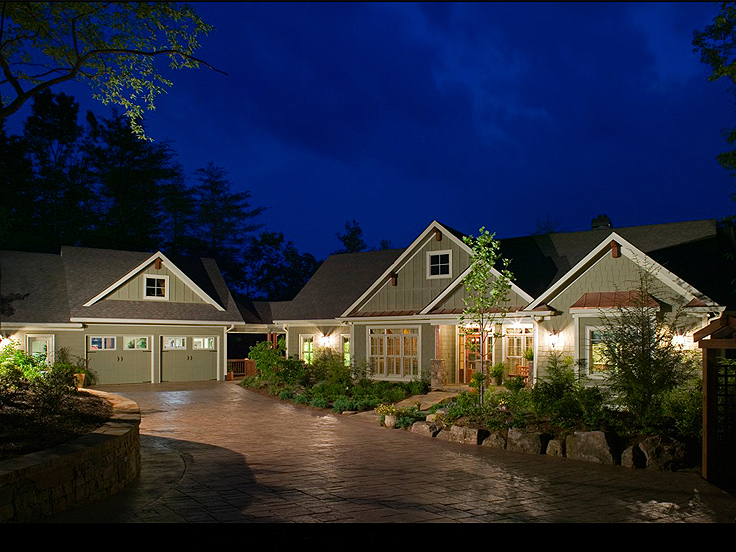 Whether you’re looking for a mountain cabin or a weekend getaway or a luxurious Craftsman home designed for year-round living, you’ll find it in the Mountain House Plans collection. We invite you to browse these cozy and inviting home plans.